The nuclear energy sector employs a considerable workforce around the world, and with nuclear power projected to grow in countries with increasing electricity demand, corresponding jobs in the nuclear power sector will also grow. 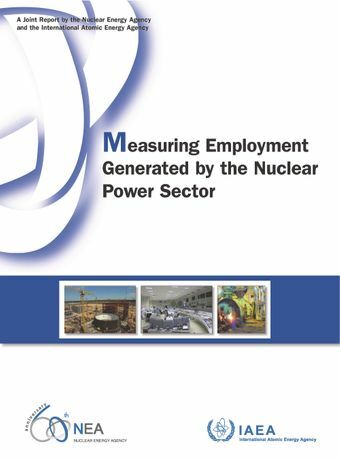 Using the most available macroeconomic model to determine total employment – the “input/output” model – the Nuclear Energy Agency and International Atomic Energy Agency collaborated to measure direct, indirect and induced employment from the nuclear power sector in a national economy. The results indicate that direct employment during site preparation and construction of a single unit 1 000 megawatt-electric advanced light water reactor at any point in time for 10 years is approximately 1 200 professional and construction staff, or about 12 000 labour years. For 50 years of operation, approximately 600 administrative, operation and maintenance, and permanently contracted staff are employed annually, or about 30 000 labour years. For up to 10 years of decommissioning, about 500 people are employed annually, or around 5 000 labour years. Finally, over an approximate period of 40 years, close to 80 employees are managing nuclear waste, totalling around 3 000 labour years. A total of about 50 000 direct labour-years per gigawatt. Direct expenditures on these employees and equipment generate approximately the same number of indirect employment, or about 50 000 labour years; and direct and indirect expenditures generate about the same number of induced employment, or 100 000 labour years. Total employment in the nuclear power sector of a given national economy is therefore roughly 200 000 labour years over the life cycle of a gigawatt of nuclear generating capacity.